How to use E.S.E. pods for coffee makers? What is ESE? 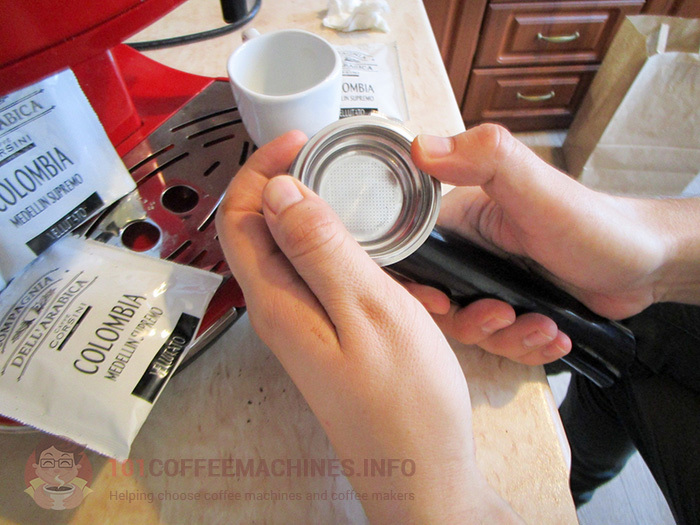 Step by step guide to cheap and clean way of making espresso at home. All modern Delonghi pump coffee makers (ECP series, ECO ans EC series) and all Philips/Gaggia/Saeco models (Saeco Poemia HD 8323, HD8325, HD8327, Gaggia Baby and others) are compatible with E.S.E. pods. Other brands like Breville, Hamilton Beach, Clatronic (all of them are OEM manufactured, that means one factory in China makes the same coffee makers under different labels) could be or could be not E.S.E. pods compatible. You should check if there is a special E.S.E. sign on the machine or in the manual. You still can use pods in any coffee maker with pressurized filter baskets (that mean almost any pump espresso maker for home use). Nevertheless the result would be little bit poor. 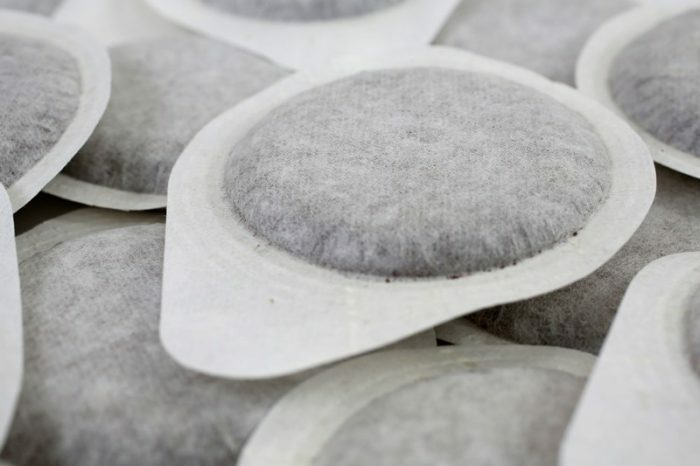 You can’t use pods with unpressurized filter baskets. 2. The E.S.E. 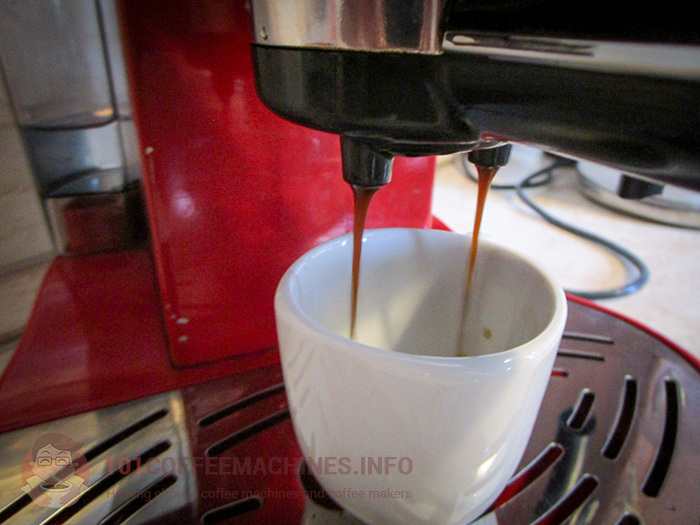 (Easy Serving Espresso) itself is a standart developed by italian company called Illy. It is famous name in the coffee world. This standart regulates form (round with holder), size and dimensions of the pod (44mm in dimater) and weight. It’s always 7 gramms (.24 oz) of finely ground and tampered coffee inside. The standart is open, so any coffee producer could make E.S.E. pods. Unlike single serve capsule systems like Nespresso, Dolce Gusto or Keurig that are proteced by patents. That’s why pods are cheaper than capsules. 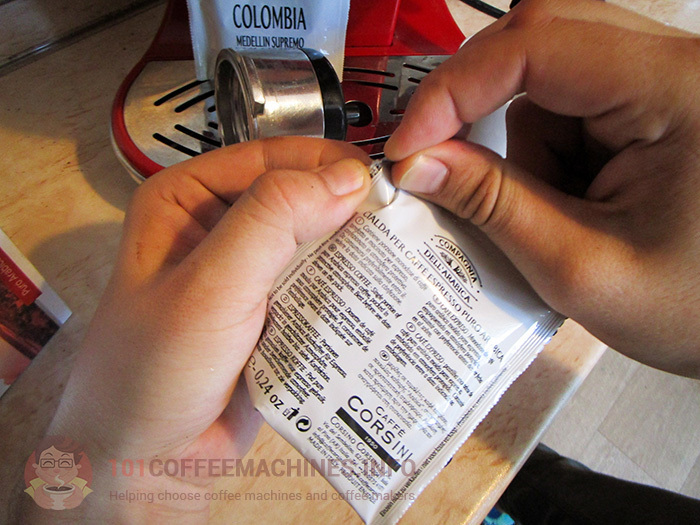 Nevertheless in terms of price per cup pods are more expansive compared to using whole beans and coffee grinder. 3. ESE is not the only pod (cialda) standart. But the most popular one. ESE pods combine easiness and cleaness of single serve capsules and control over the process like in traditional approach with ground coffee. However, pods also combine the cons of both ways. Pods are easier to use, but not super easy compared to capsules. I think that’s the reason why cialdas loose their popularity. Majority of people that are seeking cleaness and easiness switch to Nespresso/Dolce Gusto/Keurig etc. Real espresso lovers prefer fresh ground coffee and think that ESE pods give more watery taste and less crema. And I personally agree. Still ESE pods are ‘golden middle’ and reasonable choice in some cases. Like in case when you left your grandma in your house and have only five minutes to explain her how to make coffee. 4. Anyway, how to brew espresso using ESE pod? Read my step-by-step guide with photos below or simply watch youtube video that I filmed for you. Step 1. 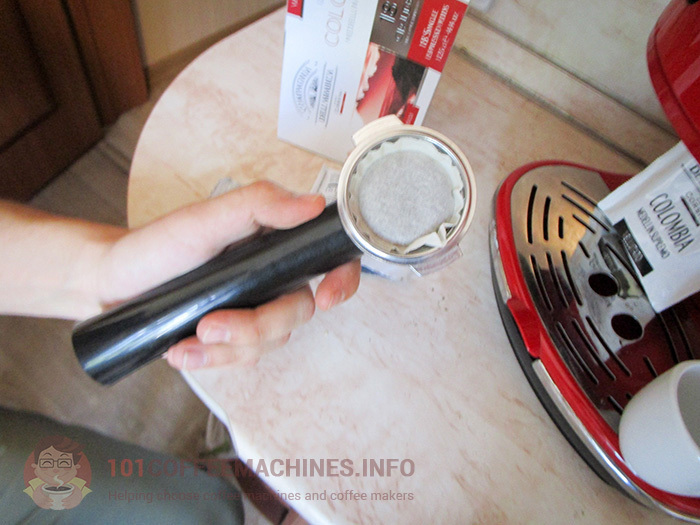 If you have De’Longhi’s coffee maker, you should change filter in your portafilter. Choose one with ESE sign on the bottom (it was in the box). For other coffee makers simply use single shot filter. Step 2. Open the packet. Each pod is packed in sealed in water- and airproof package to keep coffee as fresh as possible. Step 3. Put the pod inside the filter. No need to tamper! Step 4. Install the portafilter and start the brewing proccess as usual. Your espresso is ready, sir! Now you simply need to throw away used pod. It’s biodegradable, by the way, since pod filter is made of paper. And there is no need to wash the filter or brush away ground coffee on the table. Clean and simple. Yes. The single shot basket of KitchenAid is designed to be used for ESE coffee pod also. I know tastes are very different, for different people and drink styles, but am curious as to which ese pods are recommended by this group ? I’m looking at using the Delonghi 680 in my motorhome where space is at the upmost premium. As a start point I would likely recommend Illy blands if you like more bitter taste, because they are distributed worldwide, always have the same taste wherever you buy it and they have two types of pods (dark and medium roast), so you can determine what you prefer more. Lavazza is also a good start point for bitter espresso (Gran Crema is more balanced, still bitter, while Crema e Aroma is classic Italian espresso, which could be even too bitter). Hi, Fiona. This machine is only capsules of its own type (Metodo Iperespresso). You can’t use ESE pods with X7. GROUND EXPRESSO WORKS FINE IN MY DELONGHI EC155 BUT WHEN I USE PODS NOW…..I GET COLORED WATER? 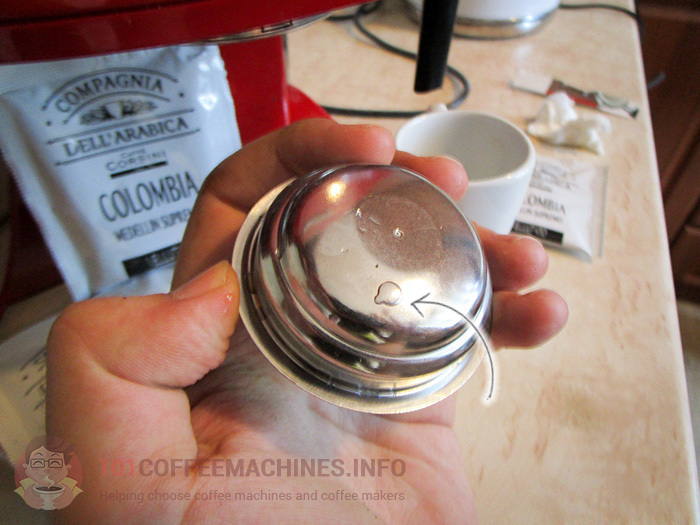 Do you use pressurized one-cup filter for ESE pod like this one? I am looking to purhase the new Breville one touch vcf108 machine. It says ese pods and only used to dolce gusto capsules..in the uk what brands can i purchase and where from? Feeling a bit lost on where to source them and if worth the change. Morning! Where does it say so (about Dolve Gusto compatibility)? There must be a mistake. It’s only ground coffee or ESE pods (which is not the same). 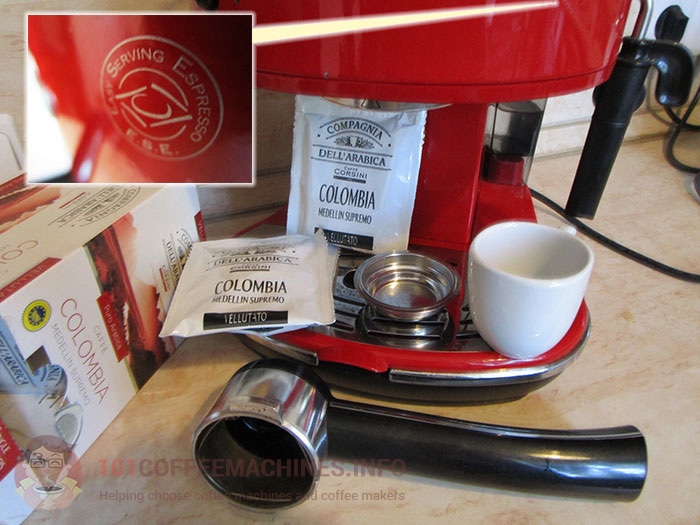 Theoretically, it may be converted to Nespresso capsules compatible machine if you will buy a part from South America, where this machines (there it is called Oster Primma Latte 2) goes with Nespresso filter (but I don’t now how tu buy, ebay?). Anyway, I recommend to read this Mr. Coffee OneTouch Barista Review (another replica of this model), it’s quite a contraversial espresso machine. I have been using ESE pods with the same Delonghi Eco 310 Machine, but all I get is light brown water or even normal water not espresso. What seems to be the problem? Hi, Assem and sorry for my late reply. Check if you use smaller filter baskets, which is designed for ESE pods. Put it deeply on the floor of the basket. If you ese Illy pods, then they have “sides” – make sure you put it the right side up. 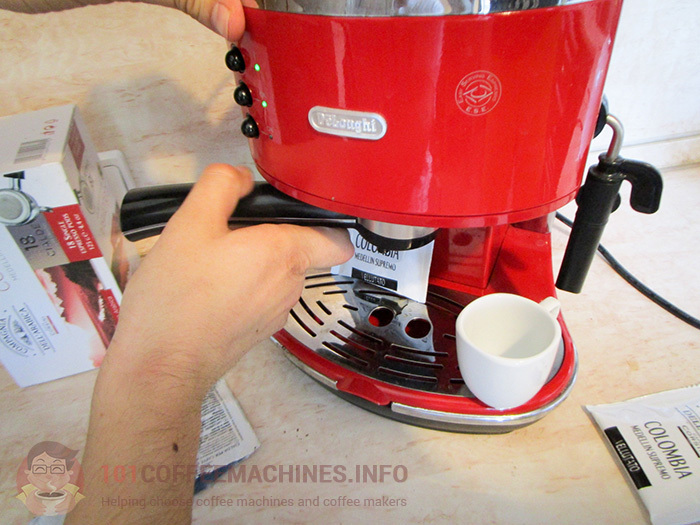 Try to test pods by renowed brands like Illy ot Lavazza, for example. Some unknown brands could make ESE pods in the not very ‘correct’ way. Finally, pre infusion may help – start the water supply for 2-3 seconds, then stop for 2-3 seconds, then continue. However, it’s always the case, as I mentioned in my review. The espresso made using a pod will always be more watery than even with 1-cup filter filled wih tamped ground coffee. 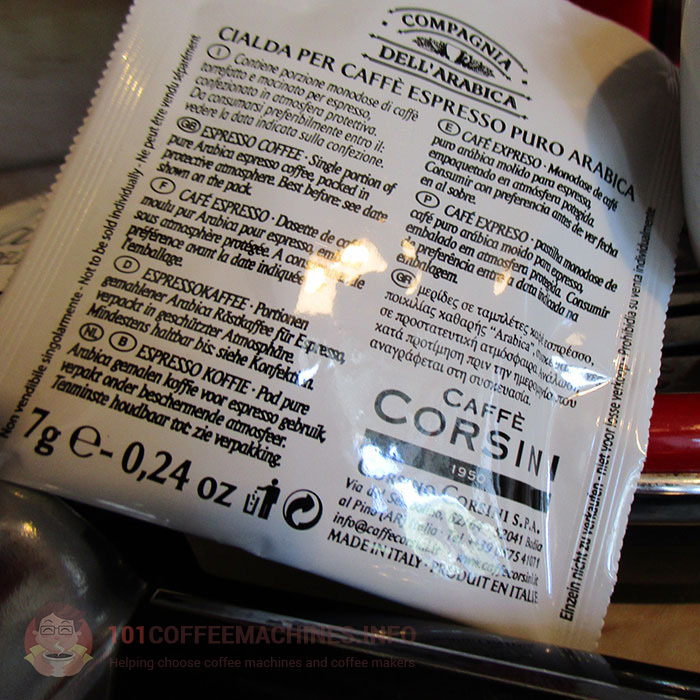 And especially if you get used to one espesso shot made using 2-cup basket (14g of coffee – the same as they use in coffee shop on professional machine).